t memoir, heartfelt advice, and some wonderful tips on living life to its fullest. 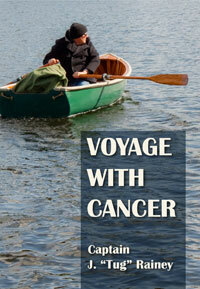 Kindle edition available from September 2011, with part of the book proceeds donated towards cancer research. About the AuthoCaptain Jerald Tug Rainey was born in Winchester, Idaho. He grew up in Coeur D’ Alene, Idaho and Graduated from Central Valley High School in Spokane, WA. The Rainey family had a cabin on Pend Oreille Lake near Sandpoint, Idaho where they spent their summers. Tug got his first boat when he was 8 years old. Because he was a skinny little guy, the 5 hp engine could make the 12 foot skiff fly across the water. He started racing boats when he was 11 years old. His father was a watch maker and taught horology and gemology at North Idaho Junior College and later at Spokane Community College. More importantly he was a mechanical genius and could take a 10 hp mercury, soup it up and get almost twice the hp out of the engine which made Tug very competitive on the racing circuit for kids. Both of his parents were World War ll veterans and very proud of their service. On the Rainey living room wall hung pictures of family men and women in uniform. In the Rainey family it would have been un-American not to join up. There were no Coast Guard uniforms on the wall, and so Tug decided that would be his service. Captain Tug spent 22 years in the United States Coast Guard, starting as a Seaman Apprentice, came up thru the hawse pipe, and retired as a Lt. Commander, after his command at sea. After the Coast Guard he went on to get an Unlimited license, sailed with Military Sealift Command during Desert Storm, commanded all types of vessels including oil spill recovery vessels, Cruise ships, deep dive exploration vessels, and oceanographic research vessels. He met his first mate Ruth Rainey in 2001, and they were married a year later. Ruth was born in Nebraska and grew up in Colorado. The cooking in this book reflects both of their cultures. Tug brings the Northwest English/Irish and Ruth brings the Southwest Russian/German cultures to the table. While Captain Tug sailed in the Gulf of Mexico on ships supporting the oil and gas industry, he was exposed to a lot of Cajun cooking. Some of his favorite shipboard recipes found their way into the book. The cancer was an unexpected, unwanted surprise that changed both of their lives forever. Ruth became the cheerleader and has had to deal with un-imaginable hardships to keep the family ship afloat and on course.